BRAVES SHOCK SHORE AND MID SOUTH IN THE SWAMP! Middletown South loses at home for first time since 2007! CLICK ON PICTURE OF CAPT BRIAN BRENNAN FOR APP STORY ON THE GAME! THE YEAR OF THE BRAVES? This team has the talent to be No. 1 in these rankings, but after several slow starts in previous seasons, the Braves have to show me something first. This is the most hyped Manalapan team since the days of Cory Brooks and Co. at the turn of the millennium, and that team struggled mightily under the weight of expectations. This is a veteran group with a Division I quarterback in Rutgers recruit Mike Bimonte, a 1,000-yard rusher in Josh Firkser and almost everyone back up front on both sides of the ball. I honestly think this team is much better than No. 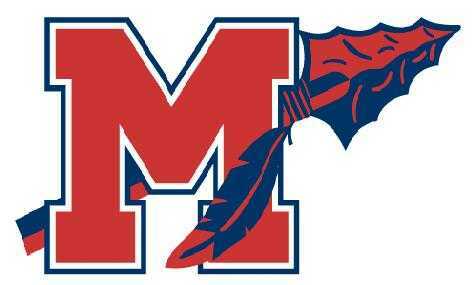 7, but given its track record, Manalapan will have to earn a higher ranking. The Braves open with an improved Jackson Memorial team that dominated them defensively last year in a 13-8 win, so we will find out right away if all the hype is justified. If this team has a great season, I guess we'll have to give the Invisible Man the Coach of the Year award, as the Braves technically won't have a head coach until after the season starts. Early on Saturday, Sept. 11, well before Manalapan's 7 p.m. game at home against Jackson Memorial to kick off the season, senior captain and starting defensive lineman James DeBlase will be at Ground Zero with his family, remembering the man who shaped his life and instilled his love of football as a former Pop Warner coach in Manalapan. This is the second straight year that Manalapan has opened the season on the anniversary of the death of Jimmy DeBlase and everyone else who perished on that nightmarish day in 2001. Last season, James decided to play against South Brunswick in the season opener, marking the first time he did not visit Ground Zero with his family since his father died while working for Cantor Fitzgerald on the 105th floor of the North Tower that morning. His father was on his mind in the pre-game last year, but once the action commenced, it was all football. The Braves lost to South Brunswick, 20-7, which started a spiral to an 0-4 start. DeBlase is hoping that maybe the Braves can get a little lift from above in this year's opener from a man who was on the phone with his wife, Marion, before a commotion erupted that fateful morning and he informed her of the incomprehensible news that a plane had flown into the building and he had to hang up. FOR LEADING THE MONMOUTH ALL SHORE TEAM OVER THE OCEAN TEAM 12-10! 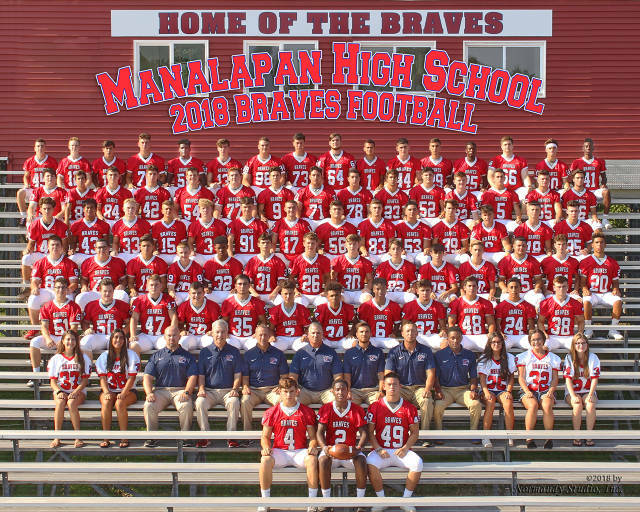 YOU ALL REPRESENTED THE MANALAPAN BRAVES FOOTBALL FAMILY VERY WELL! It truly was an honor to be graced by the presence of Captain Brian Brennan of the 101st Airborne today at Manalapan HS. 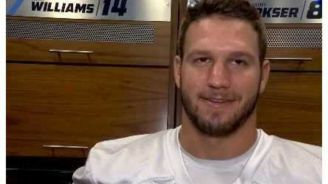 When Captain Brennan was asked by a student-athlete why he was still serving in the Army after surviving an IED explosion and losing both his legs, Capt Brennan replied, "Because I haven't given enough yet; I still have more to give my country." Truly one of the greatest young men and Americans you will ever meet. Currahee! BRAVES INVADE AND CONQUER MIDDLETOWN! For the second week in a row, the Manalapan Braves traveled to play in Middletown. After last week's convincing win against Middletown South 35-28, the Braves dominated Middletown North 35-0. Click on the #14 picture above for the Asbury Park Press story. BRAVES DEFEAT FREEHOLD TOWNSHIP ON HOMECOMING-- MAKE IT THREE IN A ROW! BRAVES CLIMB TO NUMBER FIVE IN THE SHORE! I would like to take a moment and thank everyone for their incredible support through some difficult times for my family and me. There is no way I could ever thank you all individually or repay what your support has meant to me. I would like to thank you for your time, effort, and sense of righteousness that you all displayed, whether it was through the dozens of emails, the pat on the back, or attending the Board of Education meeting. You, along with the coaches and young men in this program, make it one of the premier programs in the Shore conference. I will be forever grateful for your words and actions of encouragement. We truly do stand alone-- together. MANALAPAN BRAVES EXPLODE TO NUMBER 3 IN THE SHORE! BRAVES DEFEAT OLD BRIDGE TO MAKE IT FOUR IN A ROW! GAME WAS 40-0 AT THE HALF. Click on the PRESS FOR A CURE logo for the story of the game. BRAVES SOAR INTO THE TOP 20 IN THE STATE! See MSG Varsity for the entire list. BRAVES GIVE GAME BALL TO THE DESANTIS FAMILY! PLAY0FF-BOUND BRAVES DEFEAT TOMS RIVER NORTH WITH 27 SECONDS REMAINING! CLICK ON PHOTO OF JOSH FIRKSER FOR GAME STORY. BRAVES DOMINATE HOWELL 49-14 FOR SECOND TIME THIS SEASON-- ADVANCE TO SEMI-FINALS OF THE STATE PLAYOFFS! Click on the photo below for the APP story on the Braves 49-14 resounding win over Howell in the first round of the State playoffs! Click on the photo above of the Firkser brothers for the game story from the News Transcript. Click on the Sayreville logo above for the All Shore Media story. News Transcript announces FRHSD ALL DISTRICT TEAM! CONGRATULATIONS TO ALL THE BRAVES! JOSH FIRKSER NAMED OFFENSIVE PLAYER OF THE YEAR IN THE SHORE CONFERENCE BY THE ASBURY PARK PRESS! Click on Josh's picture for complete story. Play of the year: Bimonte to Firkser with seconds left to defeat TR North! BRAVES MOVE UP TO NUMBER FOUR IN THE SHORE! click on #14 logo above for full Shore rankings.